Beautiful Modern Metal Wall Hangings for Your Home! The Most Beautiful Metal Wall Art for a Modern Home! While browsing a few pieces I found so many gorgeous metal wall hangings and sculptures that I couldn’t wait to create this page! These metal pieces will usually catch the light and shine beautifully! On this very ‘metallic’ page you will find a few of my most favorite modern metal wall hangings that come in panels, just like this beautiful ‘Lady at the Bay’ piece you see on this picture, and also some gorgeous metal wall sculptures too that will blow your mind! 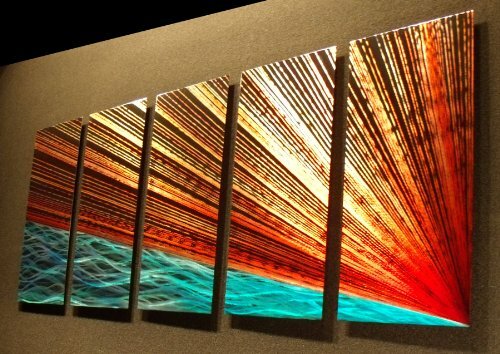 You will get 7 panels all ready to hang on your favorite spot! It looks amazing above the couch or above your bed! 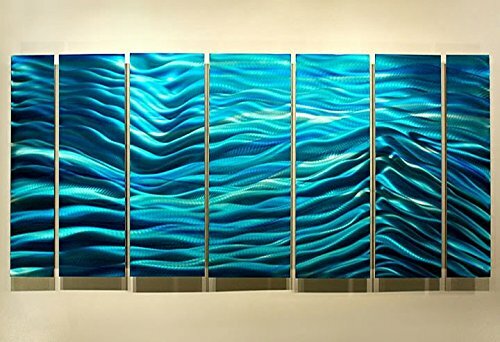 I had to show this stunning Ocean Waves metal wall hanging for sale! I can almost hear the waves! 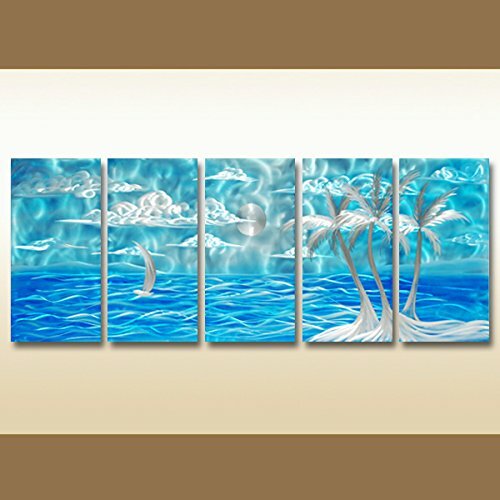 If you also love the ocean and seascape decor, this is your piece! You can have it in the living room, home office or your bedroom! *Click the image for more information. I also LOVE colorful abstract art and I went absolutely crazy with this piece! It’s perfect to create a wonderful focal point in a white living-room! 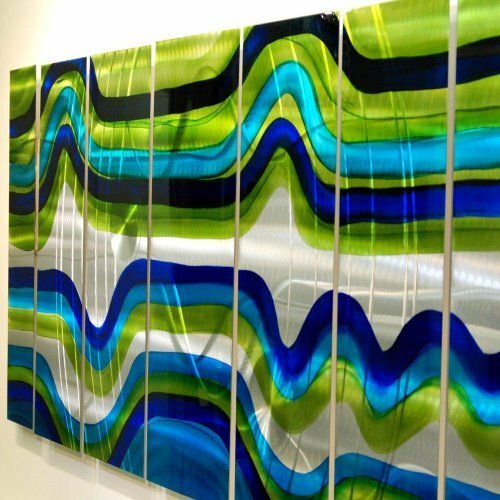 It’s an explosion of blue, green and silver colors with a gorgeous ‘glass-like’ finish. Definitely a stunning modern piece! 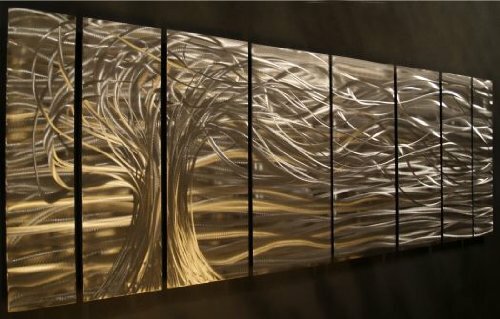 Massive Contemporary Metal Wall Art! If you are looking for something HUGE, that will really stand out and make everyone go ‘Wow!’ when they see it, then I think you are going to be very impressed by this massive metal wall sculpture. It is a huge tree and it has a beautiful three-dimensional holographic effect! The colors are a mix of gold and silver and it looks absolutely breathtaking! Very simple to hang and start enjoying right away! I bet you are going to take tones of pictures next to it after it’s done! This is also one of my favorite pieces! I LOVE blue waves and this is a stunning and very large ‘Aqua Blue Wave’ abstract metal wall sculpture! It is rust proof and it comes ready to display. The perfect modern piece to have in your office! It comes signed and dated by the artist. 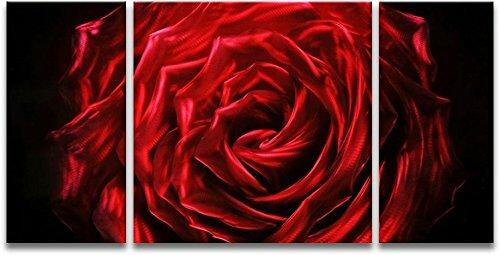 How stunning is this red rose decorative metal wall hanging? It’s a true piece of art! You can almost smell the rose! If you love the ocean and the peaceful color blue, you are going to love these! It is called ‘Seascape’… I can almost hear the wind blowing… It will look absolutely magical above your couch! You can never go wrong by adding colors to any room in the house! 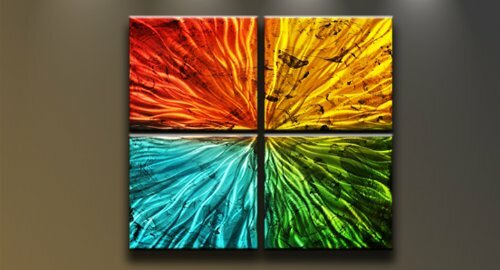 This is another stunning colorful metal wall art hanging! You will get four colorful metal squares ready to install! Don’t be afraid to splash your room with bold colors! Another large and very colorful abstract metal wall paintings! 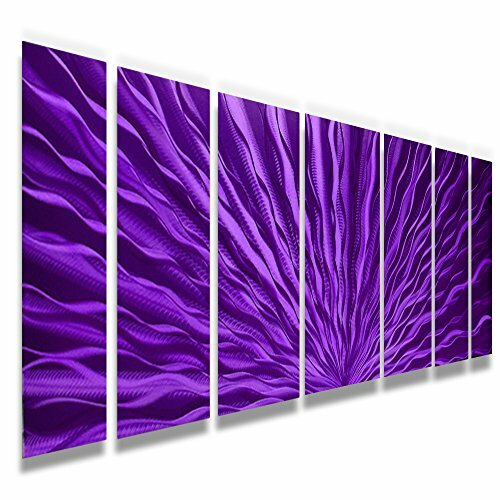 You will get stunning individual panels, each one in a gorgeous color, to hang side by side! It will bring any room alive! 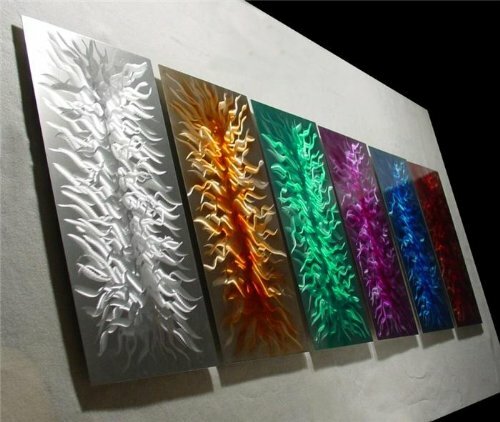 River’s Edge: Stunning Abstract Metal Wall Hanging Panels! How stunning and mesmerizing are these? It does look like a river meeting the sun rising! 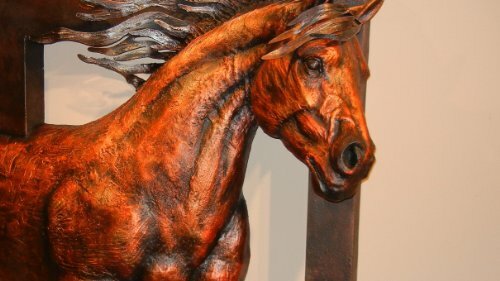 It is a giant metal horse leaping out of the frame! Definitely among the most beautiful piece of art I have ever seen! But I had to show you! This extraordinary piece was hand-crafted in Guadalajara, Mexico.